I am able to burn most eproms or chips you may need. I keep many types of chips in stock. If you don't see it listed then contact me. I may be able to do it. Contact Darksoft, he's in Europe and could help you better. Can you help to find replacement IC chips or make them? 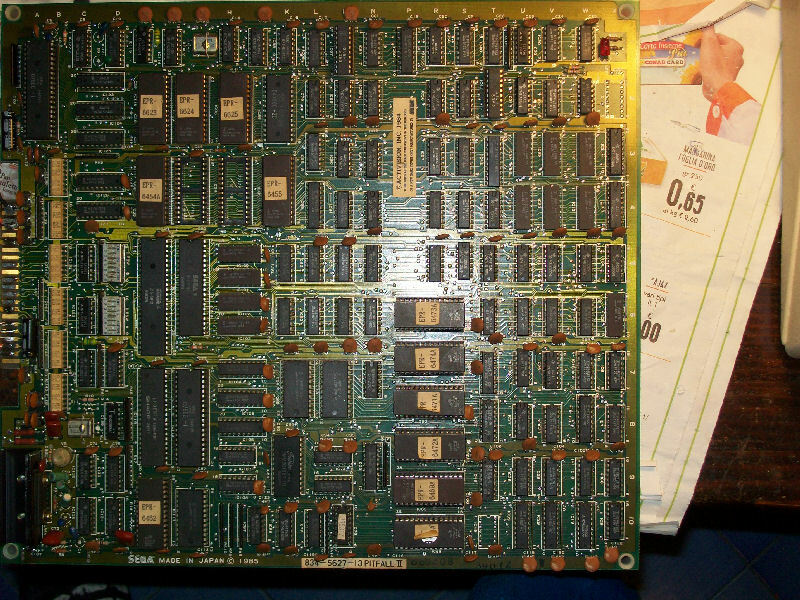 I need a missing IC chip on a Sega Pitfall 2 PCB. I don't know what kind of chip it is. If you look at imgur.com/MKbJepP you will see at the top right there is an IC missing. Best picture of a complete board I can get is here. But cant read the serial number or any data from the chip. To be honest shipping from you and back to you would be ridiculous. I would just find someone there that can erase and reprogram the roms for you. It's simple. You could probably buy a cheap programmer yourself just for these roms for the cost of shipping.. The decrypted roms are available for free on the net. I'm happy to do it for you but I charge a $25 service fee for each. Plus you have to pay to ship to me and for return shipping to you. How about a security chip for mortal kombat 3 ultimate? Any chance you have an extra mvs neo-c1 chip. I am preparing for my CPS2 multi and only now had a chance to look through the documents. Turns out my DarkStalkers has a D PAL. Would I be able to order the G PAL from you and swap it to get my board ready for the CPS2 multi or does it involve more than that? Also, I got a hold of CPS3 SF3 version that lacks all the dimms but am on the hunt for the rest. I can hook you up. PM me. Is it possible to make reproductions of Lindbergh chips?.